Whilst the GBBO gang may be making fancy pants biscuits, I am taking you down a more practical path this evening. 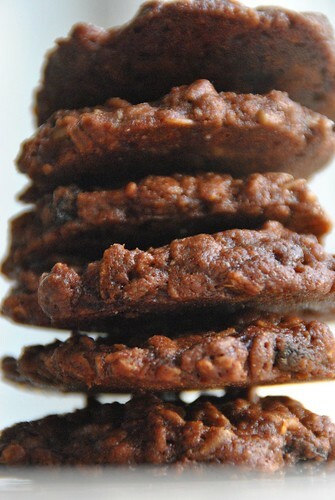 All in one, easy chocolate muesli cookies. I made these for a bring and share lunch at Euston Church. I had a load of muesli to use but I didn’t want to make flapjack or brownies as there’s always loads of them at a sharing lunch. They do go down well though, so I was looking for something in between the too but that didn’t involved faffing around with creaming butter and sugar. 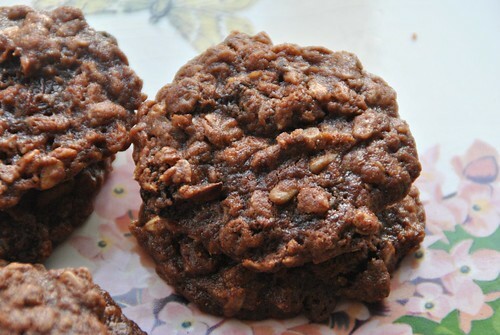 I found this Easy Oat biscuit recipe on Nigella’s website and since Mr B probably wouldn’t go for a muesli cookie, I added cocoa to act as a chocolate-smuggle. Makes: 12 cookies and 1 large tray bake. Put the flour, muesli, sugar and cocoa powder in a large bowl. Mix. Melt the butter and golden syrup either in a saucepan over a low heat or by zapping in the microwave for 30s at a time. Pour the melted butter and syrup into the dry mix and stir through a bit, then add the milk and stir until completely combined. Finally, add rye flour a bit at a time until the dough is dry enough to make a golf ball out of it. It will still be really sticky but you’ll be able to handle it without it running through your hands. I’m sorry this is very inexact but I wasn’t realistically expecting my very inexact “throw it in” adaptation of the recipe to work so I wasn’t taking notes. Put golf ball sized blobs onto a well greased baking tray and bake in the oven for 30 mins then take out and leave to cool. For the tray bake it’ll need about 50mins and then leave it in the oven as it cools. The resulting cookies / bake will be really soft so you could bake them for longer if you want a more robust bake. Love the caption on the tower! Yes!! I love that you appreciated my shoddy pun. I sat for a good few minutes but that’s the best I could come up with.